It’s Not Just About the Medicine with George Koulianos, M.D. This is a place filled with dreams, hope and love, and that’s just how founder and medical director George Koulianos, M.D., likes it. With his easy smile and affable demeanor, he lights up a room whenever he walks in. This is a man whose professional accomplishments in the field of reproductive medicine have made The Center for Reproductive Medicine one of the most successful medical practices of its kind in the country. The son of an immigrant family, Dr. Koulianos is no stranger to hard work. His father barely escaped the Greek Islands for America during World War II following 52 days and nights of constant bombings by German forces. “I grew up working with my hands. I grew up pumping gas and fixing cars. My father wanted to make sure I hated it so much that I would study hard to make a life for myself. There’s no way I could ever begin to thank my father for the lessons that he taught me about life,” Dr. Koulianos said. His father passed away when he was in medical school, but he would certainly be proud of his son. Dr. Koulianos isn’t just a successful physician. A few years ago he embarked on a new venture that began as a bit of a hobby for him and a summer job for his son and daughter. Little did he know just how successful or how much fun he would have being a farmer. With more grocery stores and restaurants participating in Buy Local campaigns, small organic farms such as Dr. Koulianos’ are becoming more popular on a much larger scale, plus it means more to residents to know that their produce was grown within just a few miles of their community. “We’ve had more people approach us about putting our products on their shelves and on their menus…at times it’s been more than we can. We’ve grown so much from what began as land for Dove hunting and hay to now supplying two of the best chefs in Mobile County and new customers in Baldwin County with our produce,” Dr. Koulianos explained. As much fun as he was having farming with his son and daughter, Dr. Koulianos realized his little patch of heaven had a different purpose. He was already using it as a way to teach his children responsibility and life lessons about their future, but this lesson was more for him. What began as a small hobby then a family tradition of passing on life lessons from father to son and finally an extension of his chosen profession, Dr. Koulianos said working his land gives him a sense of peace and is a profound experience that’s “good for the soul.” While his son and daughter have moved on, the farm continues to prosper in more ways than one. “I think one of the great lessons we need to teach our young doctors is that you really are practicing something very special. Medicine might be science, it might be curative, but ultimately, more than anything else, it has to be healing. I really believe in the calling of medicine and in its own way, it’s its own unique ministry. My medical license is very special to me. It means I have a moral obligation to put the needs of the citizens of this state before mine. That’s what a license to practice medicine means. So a farm fits beautifully with the practice of medicine because I’m helping my patients in a different way,” Dr. Koulianos said. Following Your Passion with Peter Strogov, M.D. FORT PAYNE – It’s not uncommon for physicians to have an unusual path to medicine. Like many professionals, not all physicians start out wanting a career in medicine but someone – or something – along the way changed their minds. That’s what happened to Fort Payne pediatrician Peter Strogov. It happened on the one day that changed the world forever. After graduating from high school, Dr. Strogov admitted to having “absolutely zero direction” and no idea what he wanted to do with his life. He worked construction, painting, or as he put it, “everything under the sun,” before he decided to go back to school at his local community college. Headstrong and determined, his intent was to graduate and transfer to one of the most competitive four-year colleges in the country. At Harvard, Dr. Strogov completed his degree in economics and thought he had found his calling in the world of finance. That all changed on Sept. 11, 2001. “My wife and I just started volunteering around the Twin Towers to help with water and food. We were really involved in the recovery efforts. During that time, reflecting on what life’s about, I found the pursuit of economics, finance and money to be actually very unimportant,” he said. He was soon looking for a different path and found it in medicine. But finding a specialty would prove challenging. “I was 100 percent sure I was going into surgery, without question. But something clicked when it came time for his obstetrics and pediatrics rotations, and Dr. Strogov finally found his calling. Empowering parents is also part of his business model at Fort Payne Pediatrics. The clinic nestled in the heart of DeKalb County has continued to grow to a point at which a new facility is necessary and with it will come some much needed and wanted TLC for patients and their families as well. The clinic already hosts an asthma clinic, which has been tremendously successful and has opened the door for so much more such as Dr. Strogov’s Infant Safety Initiative, Diabetes Prevention initiative, and nutrition and lifestyle modification initiatives. Dr. Strogov and his staff are beginning with the basics, such as car seat safety classes and SIDS education, while future plans include a community garden and educational initiatives to improve the lifestyle of not only pediatric patients, but the community at large. His energy is contagious, which is just one reason why he was chosen as Alabama’s 2018 Community Star to help celebrate National Rural Health Day 2018 by the National Organization of State Offices of Rural Health. “We have really been pushing hard this past couple of years to reach out in the community and do more than just see patients. We have created partnerships in other communities to give providers ownership in clinics in rural communities. Our clinic in Fort Payne is the largest, but we have four, and we’re starting to spread our practice model around hoping we can continue to grow to cover as many rural areas as we can with at least one physician and a nurse practitioner or two in each location. It’s not easy, but we’re trying to recruit more physicians to Alabama in these rural north Alabama areas. We’ve got great hope for the future.” he said. Out of Chaos…Life…with John Mark Vermillion, M.D. MONTGOMERY — The dictionary defines medical trauma as an injury to living tissue caused by an extrinsic agent. However, Montgomery trauma specialist John Mark Vermillion, M.D., has his own personal definition. He’s worked since 2005 to build the River Region’s premiere trauma center, which is located at Baptist Medical Center South. This is Alabama’s fourth largest trauma center. When he first arrived in Montgomery, even he was taken back by the fact the region did not have a trauma center. At the time, Montgomery’s hospitals rotated ERs of the day. It was an incredible strain on the professionals taking care of critical patients brought to the emergency room. It wasn’t enough. It’s easy to imagine how fast-paced it can be once a trauma rolls into the emergency room. But, that’s when this Texas native is at his best. What may look like chaos to some is fuel for Dr. Vermillion, and it pumps through his veins like quicksilver. This is what he thrives on. This is what he grew up on. This is in his DNA. Two of Dr. Vermillion’s uncles, his father and grandfather are all physicians as well, and they all trained at the same hospital in Texas, but he said he’s a bit of the black sheep in the family. It didn’t work, and he has his grandfather to thank for that. His grandfather was a physician in a small town and would often take him to the hospital at night so he could act as his first assistant during surgeries. At the young age of 14, the surgical procedures, blood…nothing bothered the young boy. It infatuated him. Now fully entrenched, he had his mind set on a career in medicine. 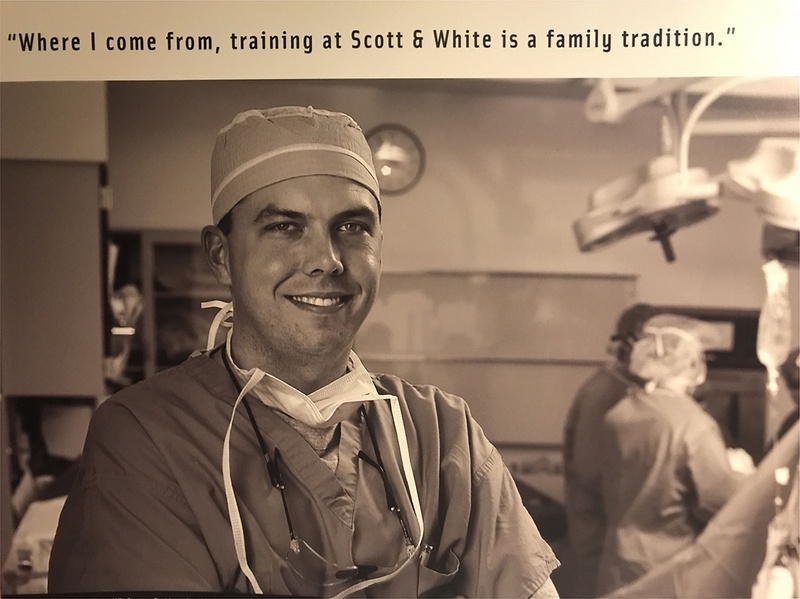 He planned to go to medical school, do a family practice residency, then a year of surgical training, and finally go into practice in a small town like his grandfather. But, that all changed in medical school. “I liked the surgical procedural side of things a lot better than I liked the primary care medicine. It fit my personality a lot better. It’s high-rush, high-stakes, high-adrenaline style medicine. When I was 14 and went into that first surgery with my grandfather I thought it was awesome. Nothing about it bothered me. 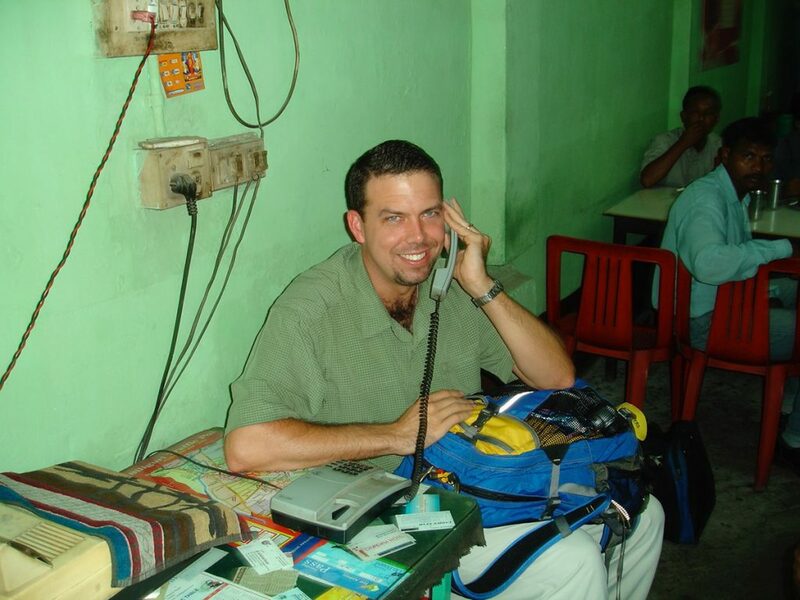 It was a great exposure for me at an early age,” Dr. Vermillion explained. And the stakes are very high. 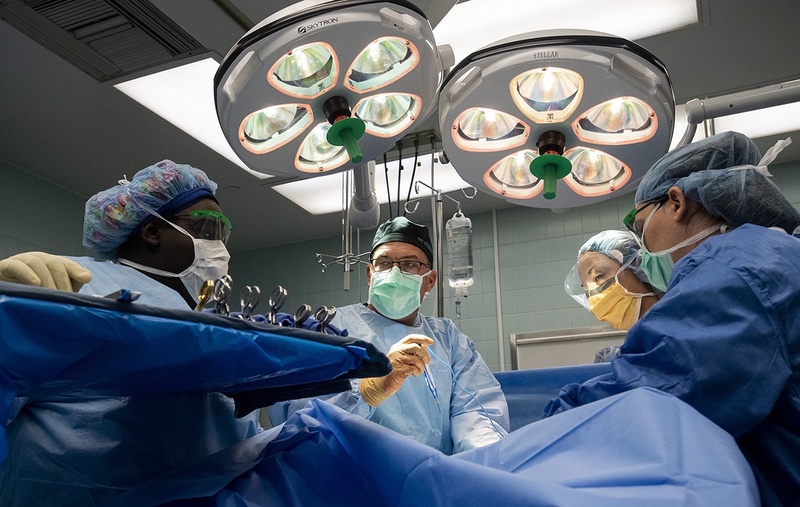 Since 2005 when Dr. Vermillion and Baptist South began building the trauma center, it has grown to include a full medical team with students. 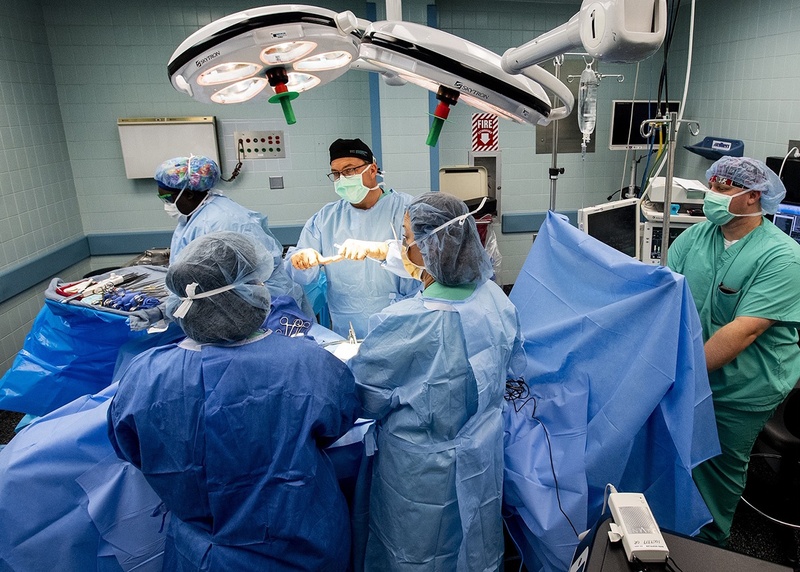 The hours can be long and arduous, and the team can easily treat more than 2,000 trauma patients in a year. Dr. Vermillion has a very good memory for his patients and remembers almost every one of them, but the ones who affect him the most are children. “Children are very hard for me. Kids get to me,” he said, patting his chest. With a wife and children of his own at home, it’s easy to see why treating a child with a trauma could be the one thing to stop Dr. Vermillion in his tracks even for a moment. It’s also why he treasures every moment he can away from the hospital. The Vermillions have nine children, two of which are foster children. Dr. Vermillion isn’t one to stand still very long, though. 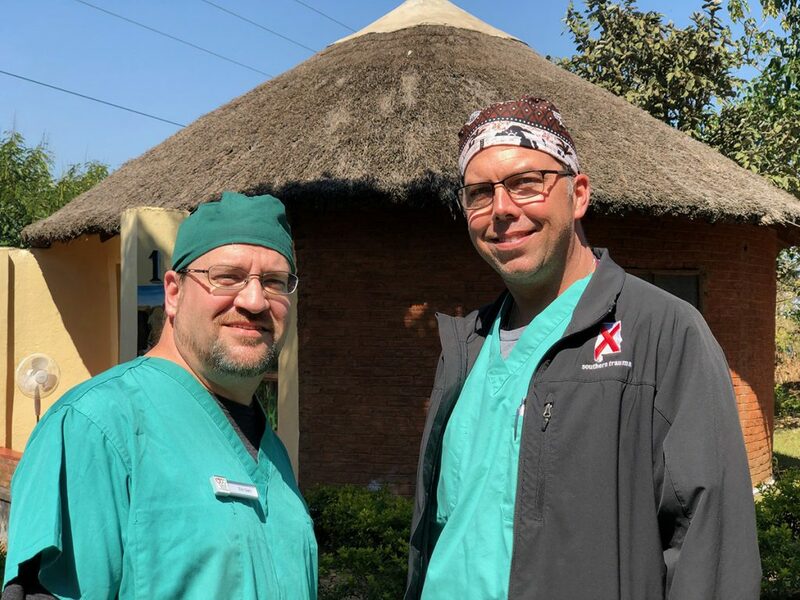 He’s part of a medical mission team through the Chikondi Health Foundation that regularly travels to Malawi where the foundation supports a hospital. 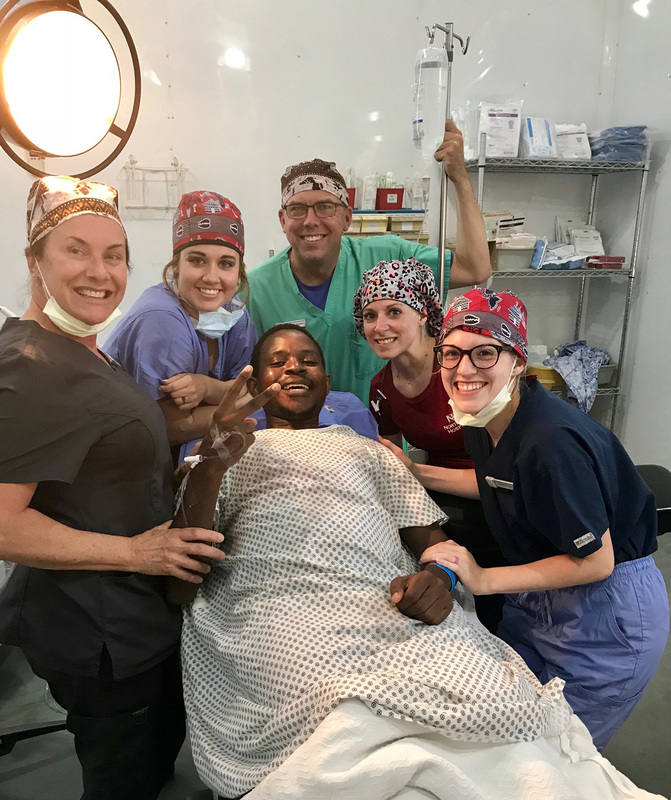 While there, the team takes care of basic medical needs, but can also perform minor surgical procedures that can be life-changing for the patients. When he goes, he tries to take one of his children with him, trying to do for his children what his grandfather did for him. He’s not sure if it’s working, though. His daughter lasted only a few minutes during a procedure before going back to the orphanage. *Photos compliments of Baptist South and Dr. John Mark Vermillion. A Promise to Help with Sandra Mathews Ford, M.D. BIRMINGHAM – When Sandra Ford was just 8 years old, her father took her to the doctor. Back then, Alabama was under segregationist laws, so it wasn’t anything out of the ordinary for young Sandra and her father to wait on one side of the doctor’s office from the time they walked in around 4 p.m. until after 11 p.m. But there was one time a visit to the doctor left an indelible mark on her, which not only shaped her career in medicine, but it also marked the beginning of her spiritual path. Originally from Montgomery, Dr. Ford’s parents were school teachers in Clayton. During the week, the family would live in Alabama’s Black Belt and in Montgomery on the weekends. The family would do their best if someone got sick during the week. Health care in rural areas back then was different than it is now. It was actually worse. That one visit to the doctor as a child changed Dr. Ford’s life. It planted a seed, which grew through the years. “This is how A Promise to Help started,” she said. 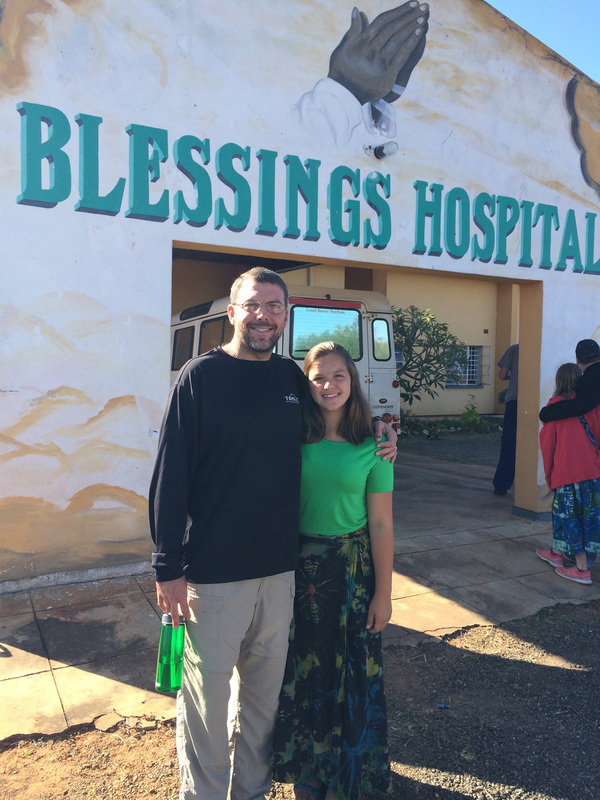 A Promise to Help is a nonprofit medical missionary organization founded by Dr. Ford and her husband, Henry, which is now in its 16th year. The organization serves Alabama’s Black Belt counties, including Barbour, Bullock, Butler, Choctaw, Dallas, Greene, Hale, Lowndes, Macon, Marengo, Montgomery, Perry, Russell, Sumter and Wilcox Counties. “We’ve been to the most underserved, underprivileged and underinsured counties in this state. A Promise to Help is a volunteer-based organization whose goals are to assist in eliminating health care disparities in Alabama. We have physicians, nurses, ministers, media specialists, counselors, social workers, business leaders, skilled laborers, community activists and others all working together with one thing in mind — helping others,” Dr. Ford said. The organization hosts volunteers worldwide who come to Alabama once a month to visit communities in the most need. There are 12 missions a year, and although the organization is designated as a nonprofit, it operates almost completely on the generosity of others by donations, not grants. “We’re both ordained ministers, so this is a ministry for us. It’s a holistic health care initiative where we can minister to the entire body. We have a medical team, a mentoring team, a ministry team, and a team to address their immediate needs such as clothing and food. This is truly a mission of God because we don’t enjoy the benefit of grants. This is just people helping other people. This is the hand of God moving all of us. People give what they can, and we accept that to give to others,” Dr. Ford said. Each month’s mission presents its own logistical challenges. Using Dr. Ford’s small medical practice in Birmingham as a base of operations, donations of clothing, medicine, equipment and other necessities are stored in every spare space waiting to be deployed once the location has been secured. After local county resources and ministries are contacted and a liaison is in place, it’s time to roll out the mobile health clinic. “It takes us a while for us to gain the trust of the people in these communities. So many different studies and research projects have come through these areas looking for information, but these things never really touched these people’s lives. And that’s what we want to do. Believe it or not, we have no agenda. This is just something that God has put on our hearts to do…to help,” Dr. Ford said. A Promise to Help is part of the Spirit of Luke Charitable Foundation™ cofounded by the Fords. If you would like more information about either organization, to make a donation, or to volunteer, visit www.spiritofluke.com. It Began with an Email with Stephen Russell, M.D. 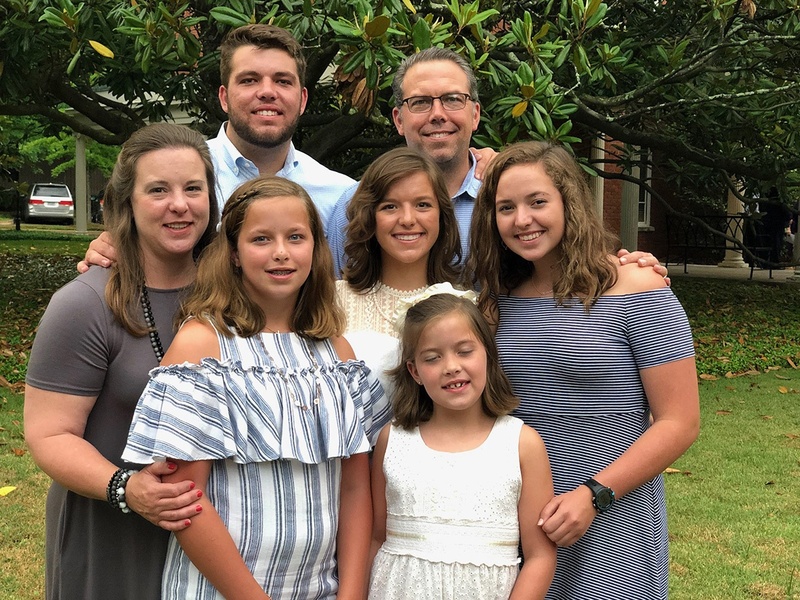 LEEDS – Benjamin Franklin said, “Either write something worth reading or do something worth writing.” For Leeds family physician Stephen Russell doing both comes naturally. As an associate professor of internal medicine and pediatrics at the University of Alabama at Birmingham, Dr. Russell is living his research for the characters he writes in his works of fiction, which are centered around Dr. Cooper “Mackie” McKay. Dr. Russell has written and published three medical thrillers — Blood Money, Command and Control and most recently Control Group — with a fourth in the works. While he admits he has always written in some fashion, it wasn’t until he was in his residency in Cincinnati, OH, when he discovered he had a gift for the craft of storytelling. In fact, he credits the simple act of emailing with his father, who was a practicing cardiologist in Birmingham at the time, with stoking the fire of his love of weaving a good tale. Not only did Dr. Russell realize his love of the creative process through those early emails to his father, but he also learned just how much he enjoyed how cathartic the writing process itself could be. Four years later, Dr. Russell began to wonder. “What if…?” Still practicing in Cincinnati, he had met hundreds of patients and had an arsenal of stories and medical scenarios. So, what next? Dr. Russell is the first to admit writing his novels wasn’t exactly what he thought it would be. While he never expected to turn in his first draft and have it magically be published, he didn’t expect it would take 13 years from draft to publication. As the two parts of his life began to converge, Dr. Russell said he wasn’t expecting the positive impact of being a published author would have on his patients. It turned out to be a pleasant surprise. “I didn’t expect I’d be talking about writing while I was at work, or having conversations about books with my patients. Then the most amazing thing happened after my book was published. People read it! They would come in for their visits and would want to talk about the book and about writing, which was a great icebreaker. The thing I love most about writing is probably the thing I love the most about being a physician which is communication. My job as a primary care physician is to listen to my patients and interpret their stories and understand what they mean from a health standpoint. How does that story end? How can that story be changed? How can that story be interpreted for a better prognosis? “That’s also the job of the writer…to create the story if it’s fiction or frame that story if it’s nonfiction and to package it in a way that clearly communicates whatever the writer is trying to tell. I didn’t think about it in those terms when I was writing my first novel, the second or the third, but as I started to be on the receiving end of other people reading my writing, critiquing it and giving comments, I realized that’s part of what I signed up for by entering into the arena as a writer, but it’s also what I signed up for by entering into the arena as a physician, which is just that ability to try and find a way to communicate what I’m doing clearly and try and help my patients communicate what they’re experiencing and feeling in a way that makes sense to them. That whole communication journey is what makes sense to me about why I enjoy writing but also why I enjoy being a primary care physician,” Dr. Russell said. EDITOR’S NOTE: Dr. Russell has written three medical mysteries, which you can purchase on Amazon: Blood Money, Command and Control, and Control Group. He promises Dr. Cooper “Mackie” McKay will return in the future. In the meantime, he’s working on a young adult novel in which he’s getting plenty of input and primary research from his four children. Creating a World Where Every Person Matters with Michele Kong, M.D. BIRMINGHAM — When Michele Kong was a little girl growing up in Malaysia, she knew the world was filled with both wonder and danger. She surprised herself and her family when she managed to kill a not-so-small python that slithered into their home. She laughs now remembering the incident, but she said someone had to do it to protect her family, and she had the shovel. Dr. Kong is a long way from home these days, but the spirit of that young girl with the shovel still burns just as bright. So, when she and her family faced the challenge of a lifetime, they created a solution that has touched thousands of lives. Her son, Abram, was just 4-years-old when he was diagnosed with autism. Because Dr. Kong and her husband are both physicians, they understood the science of the diagnosis, but what came next was a complete surprise. Dr. Kong and her husband realized very quickly that not only were there limited resources available to meet their son’s needs, there were also limited resources available for them as a family. As they began to meet other families with children on the autism spectrum they realized they were not alone in their journey. KultureCity was born. KultureCity is a national nonprofit based in Birmingham with the mission of the inclusion and acceptance of all special needs individuals and their families. Having only been in operation for about four years now, KultureCity has made major impact not only in Alabama, but also expanded to have offices in New York, Boston and Ohio. While awareness is always good, Dr. Kong said, action and acceptance are much better and together can change the culture of a city. KultureCity is about action. The organization has teamed up nationally with the NFL, NBA and NHL as well as museums, zoos and gardens, just to name a few, to create sensory rooms for individuals with sensory needs. The rooms are calming areas designed to help an individual with sensory overload regulate and decompress. KultureCity staff also trains the organization’s staff to assist fans and guests who have sensory challenges. So far, KultureCity has outfitted seven NBA arenas, three NHL arenas, two NFL stadiums, an aquarium and science center, four zoos, seven restaurants and one college. The organization has received national recognition with the NASCAR 2017 Betty Jane France Humanitarian of the Year Award and named by Microsoft as one of the best nonprofits in the nation. “We are constantly pushing the envelope to change our culture to one where everyone is accepted in every aspects of our community. A lot of times, these children have unlimited potential, but the difference between them and the typical child is because of their unique challenges they may need different resources, or different methods of teaching. We have to meet them where they are. It’s like fitting a round peg into a square hole. It just won’t fit. You can’t look at them and think that they’ve reached their limits because it is often not true. The limitation is on our perspective on what they can or cannot do,” Dr. Kong said. If you would like to know more about KultureCity, to volunteer or make a donation, click here.